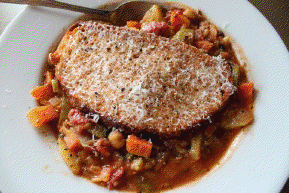 We love this minestrone soup- it’s a great way to use up vegetables from the garden! It makes a great warming dinner after a day of field work in cool fall weather. 1. In a large pot, heat oil over medium. Add onion, carrots, celery, red-pepper flakes, rosemary, 1 1/2 teaspoons salt, and 1/4 teaspoon pepper. Cook, stirring occasionally, until onion begins to turn golden, 5 to 8 minutes. 2. Add tomatoes; cook until some of the liquid evaporates, about 1 minute. Add cooked farro, zucchini, garbanzo beans, and 7 cups water or stock; bring to a boil. 3. Reduce to a simmer, and cook until all the vegetables are tender, about 20 minutes. Season with salt and pepper; stir in garlic. 5. Place toasted bread on top of soup. 6. Serve sprinkled with Parmesan. Drizzle with more oil, if desired. Garnish with Parsley. Note: Feel free to substitute; most vegetables work great in the dish.